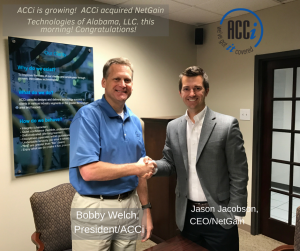 Bobby Welch, ACCi’s President is very excited to announce that this morning ACCi has acquired NetGain Technologies of Alabama, LLC. NetGain Technologies, Inc. is a Managed Service Provider headquartered in Lexington, KY with locations in several states. ACCi has acquired their Birmingham location including their clients, their managed services agreements, and one of their technical resources. This represents a significant addition to ACCi’s business from a growth standpoint, and we look forward to taking over service & support for these new clients. The technical resource we are adding is a Senior Systems Engineer named Bobby Davis. He has been with NetGain the last 2 ½ years. We welcome him to our ACCi team and we are glad to have him on board!